In 1998 that fine cricket writer, John Woodcock, selected his top 100 cricketers. The player chosen by Woodcock as the No. 1 cricketer caused controversy, mainly in Australia, when the winner, with a Test average of 32.29 was chosen over Bradman who boasts a Test average of 99.94. Those who know their cricket history were not surprised at all. After all W.G. Grace was, like Bradman, twice as good as his contemporaries and bestrode the cricket world for over 40 years. This fact didn’t stop some from trotting out the passé and frankly spurious statements that Grace was a cheat. What better way to settle the Grace myth or legend question than to look back through the ‘bible’ of cricket; Wisden, which after all started its legendary print run about the same time as W.G. came to the fore. 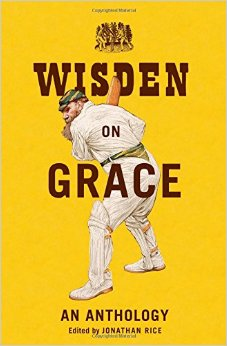 Editor Jonathan Rice, quickly assures us that Wisden did not, well not initially anyway, pray at the altar of Grace. In fact their reporters seem to have begrudgingly praised him and subtly castigated him for minor infringements. The reason why Wisden was not initially a fan of Grace is not clear and even the criticism is not overtly obvious. This is due to the rather staid style of writing in the early Wisdens. This factual style of writing can be at best perfunctory and at worst boring, so thankfully Editor Rice’s annotations both explain and entertain throughout. Rice’s own contributions are the perfect mix of information and opinion which help to elevate Wisden on Grace to the best of cricket anthologies. It must have been no easy task to trawl through the 150+ Wisdens to find mentions of ‘The Doctor’, and the pieces of writing eventually selected give as fully rounded an understanding of the ‘Old Man’ as any biography yet published, with the piece by Geoffrey Moorhouse in the 1998 edition being just about the best thing ever written on WG. It should be noted that Wisden on Grace, is not just about William Gilbert Grace but includes articles about other members of this colourful family. We discover the lesser known but no more colossal brother E.M. known as the Coroner, to differentiate him from his fellow Doctor brother, although he is never mentioned as the coroner in contemporary Wisden reports. There is the youngest brother G.F. who took a famous Test catch of that giant Australian hitter, George Bonnor as the batsman turned for their third run and the ball finally lost its battle with gravity. Unfortunately G.F. was to die just two weeks after this catch in his only Test. There are also two of W.Gs cousins, the Gilberts, one of whom was given two weeks hard labour and vanished to Canada after he was found stealing from team-mates in the Gloustershire dressing room. As we follow the Grace family through the pages of Wisden, the legend of Grace emerges. We see his foibles, his strengths and share his triumphs and tragedies such as the loss of his eldest son, W.G junior, who dies aged 31 years during an appendix operation. Minor surgery now but if you have been watching the Knick, you will know how perilous any operation was at the turn of the century. What we don’t receive through reading Wisden on Grace, is the impression that WG was a cheat, or even happy to bend the rules. We find he was a fierce competitor who loved the game of cricket and dedicated his life to it and was simply the greatest ‘cricketer’ as opposed to best batsman or bowler the game has ever seen. Wisden on Grace appears to be head the way all good anthologies should. That is from the start of the subject to the finish, however Rice does not let his reader off that easily. Instead the last chapter of the book finishes with the controversy over the Grace career figures and, most contentiously, the vexed question of whether he scored 126 centuries or 124. Rice presents, through the pages of Wisden’s past, both sides of the story. It would be a surprise if anyone after reading Wisden on Grace, and learning of the historic significance of 126 tons, does not side with the editors of Wisden in leaving the traditional figures alone, which Wisden stubbornly maintains in their career figures section. Wisden on Grace, is an excellent read, and puts the myth to bed and the legend of Dr William Gilbert Grace to the fore where the greatest of all cricketers belongs, front and centre.